Pocket Analytics supports most of the StatCounter API. Per-project visitors and page-view stats are reported. Please note that API access is only available to StatCounter customers with any upgraded StatCounter account - free StatCounter accounts do not have API access, and will not work with Pocket Analytics. You can set your API password to use either account-based or username-based API access - Pocket Analytics supports both. 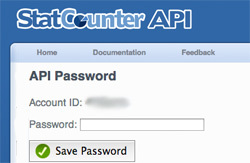 The same data is available with both methods - StatCounter currently recommends username based API access. Once you have created your password, enter it along with your Account ID or Username into Pocket Analytics, and you're all set! There is no way to obtain your account name through the StatCounter API, so make sure you enter something meaningful in Pocket Analytics. There will need to be at least one visit recorded in a project for Pocket Analytics to recognize it. All communication with the StatCounter API is encrypted using https.